I’m resurrecting Bronze Beauties, a mini-gallery tribute to the super-swell comic book covers of the 1970s (what is referred to as the Bronze Age of Comics). Kicking off the return is Marvel Comics’ short-lived female superhero book BEWARE! THE CLAWS OF... THE CAT! 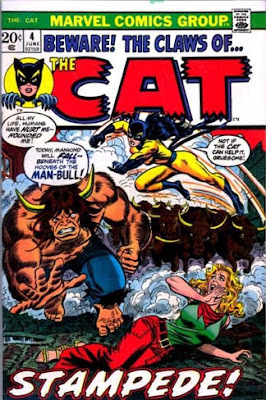 Part of an attempt by Marvel to woo female readers in the early ‘70s (alongside NIGHT NURSE and SHANNA THE SHE-DEVIL), The Cat only lasted four issues, despite artwork by the criminally underrated Marie Severin. The Cat drifted around the Marvel Universe after her series was cancelled, and in 1974 in GIANT SIZE CREATURES #1, she mutated into the super-powered feline Tigra. 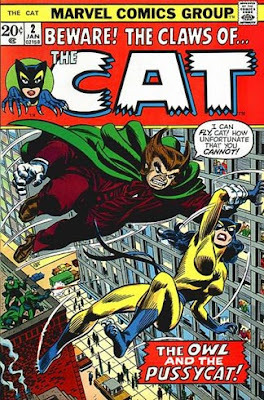 Curiously, years later, the Cat’s old costume was adopted by longtime Marvel character Patsy Walker when she morphed from teen-comic-star to superheroine and became Hellcat. I know, I’m confused, too. Here are the covers to THE CAT #2 (January 1973) and #4 (June 1973) both by the legendary John Romita. NEXT WEEK: The not always first, nor special FIRST ISSUE SPECIAL!